The PSP, along with the DS, has sort of been a last haven for Japanese RPGs. Companies like Atlus, XSEED, and Aksys Games have kept these handhelds, as well as the abovementioned genre, alive by continuing to feed American gamers with some its best experiences -- even in the wake of their demise. Nintendo has moved on to the 3DS, and Sony's portable powerhouse, the Vita, is only a few short months away. It's an exciting time for gaming on-the-go, but as the anticipation climaxes, it doesn't mean we should forget about the systems that are still here; still breathing. 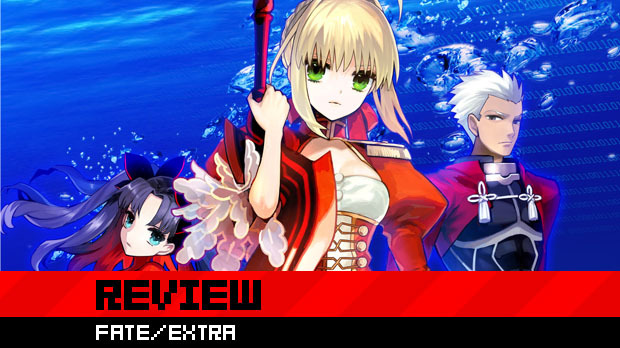 Aksys Games hasn't forgotten and Fate/EXTRA, their latest endeavor, is an example of how these systems continue to pump out worthwhile experiences. The Fate universe has had a somewhat limited existence in the U.S. Personally, my familiarity extends to having watched the Fate/stay night anime series (which ironically enough is based off its visual novel) and casually knowing of the PSP fighter: Fate/unlimited codes. I thoroughly enjoyed the anime though, so the idea of playing a Fate influenced RPG, set in parallel universe from Image-Epoch no less, quickly intrigued me. 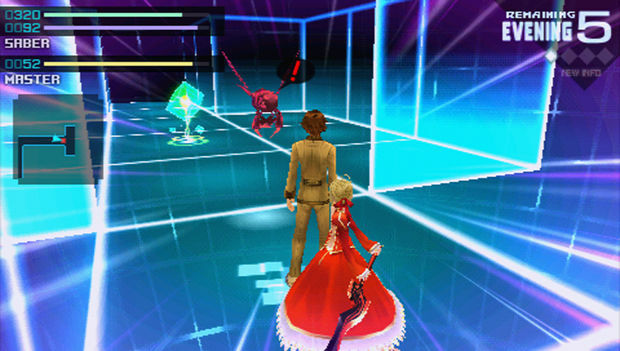 The world of Fate/EXTRA opens up amongst the confines of Tsukumihara Academy -- which serves as the games main hub. 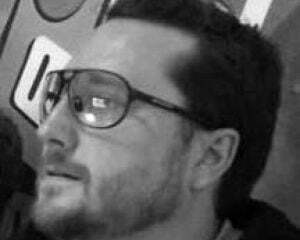 As a student, you attend class, converse with students, and even investigate (as a school reporter) rumors pertaining to the strange supernatural occurrences that have been happening on campus. It's in this introduction -- which is quite long -- that the realization is made that this game is more than your typical RPG and in fact, at times, actually more like a visual novel. Then again, from the warning message that proceeds the beginning of the game -- alerting players about the potential of dead ends -- I should have been ready for that twist. Because of its ties to its visual novel past , Fate/EXTRA is a very text heavy endeavor. While the Japanese audio is left in (voiced by many of the original Fate/stay night's performers) not all of the dialog in the game is spoken. Luckily the game benefits from having one of the best written localizations I have read in quite some time -- which makes the semi-lethargic pace of the introduction tolerable. It's a strange and bewildering ride into the game's main narrative, but once the opening events unfold and set up the proceedings for the next Holy Grail War, Fate/EXTRA begins to shine as a unique RPG experience for the PSP. 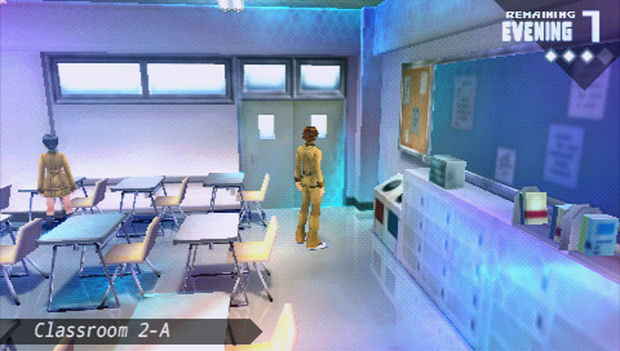 There's a very Persona 3-light feeling given off at first (in terms of aesthetics and some mechanics) but as the hours begin to melt away it becomes ever apparent that this is a beast all of its own. Once the intro is complete, players will be given the chance to chose one of three different servants to use through the games adventure: Saber, Archer, and Caster as well as decide the protagonists gender. The Saber class is your typical up-close melee fighter, the Archer is best for ranged combat, and the Caster is best with magical abilities. I went with Saber in my play through -- as I wanted to make my experience as close to the anime as possible -- but choosing any of the other classes not only affects the games difficulty, but also the way the story unfolds. With each servant housing their own unique personality, I really appreciate the fact that not every player will experience the same journey to the end. As the main narrative unfolds, you find yourself in a strange virtual world -- identically resembling Tsukumihara Academy -- and as part of the Holy Grail War. A tournament, to the death, for the fabled artifact of legend that will grant the winner their deepest desire. With no recollection of your past, winning the tournament is a must as failure results in death in the real world. It's a simple motivation to compel one to fight, but eventually the desire to know oneself -- a brilliant dissection of the human psyche by the writers of Fate/EXTRA -- serves as ample incentive to press on, even when the combat begins to fall mundane. For the most part though the battle system is as much fun as it is a test of mental capacity. Each round, a new opponent is selected, and a week's preparation time is given before the fight. Preparation for each battle unfolds in two ways: gaining strength in the arena by fighting enemies; and by collecting tactical data on the opponent to figure out their true identity. If you are familiar with the Fate franchise, then you will know that every enemy servant in the series is actually a famous warrior -- real or mythological -- and thus contains the weaknesses of that person. 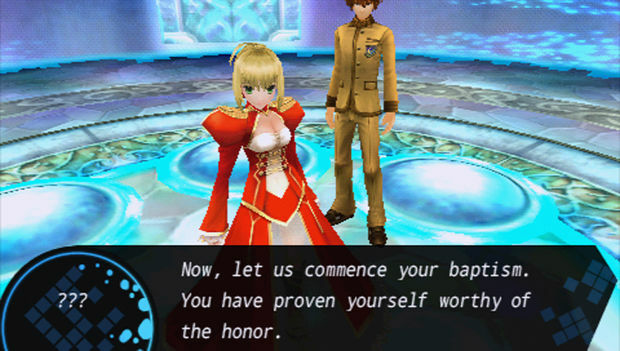 This is definitely Fate/EXTRA's strong point, as the process of collecting data on each servant further showcases the excellent localization and helps move the story forward. Acquiring as much information, as possible, may be the single most important aspect for a servant battle. The more one knows, the easier their attacks are to predict with the game's very simple rock-paper-scissor battle system. There are three basic moves: attack, block, and break ;which when planned accordingly will counter an enemy's move and negate any possible damage received. 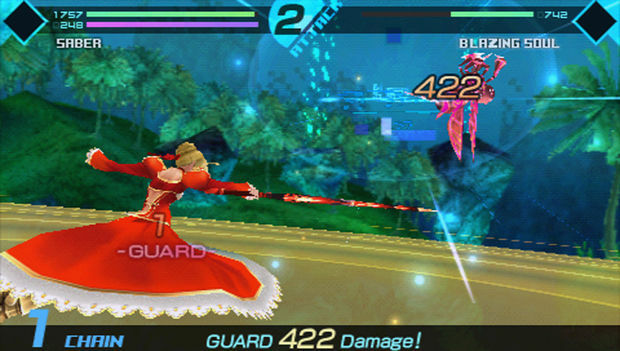 Outside of the servant battles, regular enemy fights move quite quickly once a foe's pattern is discovered. 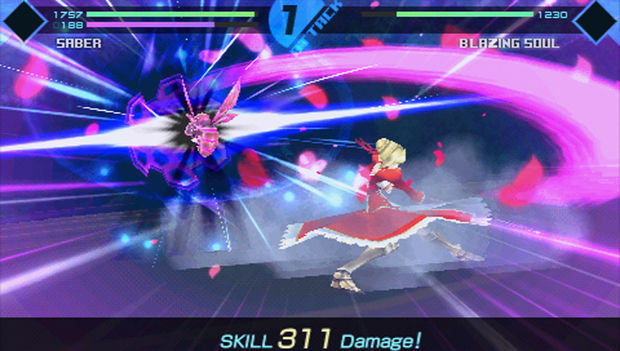 Combat is very enjoyable in Fate/Extra, but with only one character in your party and a very limited amount of adversaries per arena, they can become slightly tedious overtime. Thankfully, battles are not random -- allowing them to be dodged with a little skill -- but when you're making your third of fourth trip through an arena that looks practically identical to the last one, the game can begin to drag. Unfortunately, a slow pace is Fate/EXTRA's biggest problem. While the game has a very eclectic and well written cast of characters, it finds itself basically repeating the same process over and over through the tournament: receive a new opponent, fight and level up in the arena, and collect enough information to have the tactical advantage. While some servants mix up the way you progress through the arena (setting poison traps or having treasure hunt missions) it all begins to feel the same after around the fourth round of competition, which is a shame considering how interesting the narrative is. Visually though, the game looks very sharp. The characters models and art all look strikingly accurate and really capture the games anime essence, especially in combat. In fact combat, has some of the best looking visuals I've seen in a PSP game. Sadly the environments -- the arena and Tsukumihara Academy -- are fairly plain and devoid of any real presence. Fate/EXTRA's music is enjoyable, for the most part, but with the story revolving around the same few areas, the music finds itself essentially on repeat. It fits well, but like the rest of the game will make you feel like Bill Murray in Ground Hog's Day. Aksys Games nailed the localization with Nine Hours, Nine Persons, Nine Doors and they've done it again with the excellent writing in Fate/EXTRA. Unfortunately, a sea of monotony and repetitiveness plagues the game's potential for being one of the PSP's elite RPG's. While mechanically a solid experience from start to finish, it's a hard pill to swallow for anyone other than fans of the property or those looking for a little visual novel in their RPG. Regardless, if you are seeking an adventure that brings a little more to the table in the story department and don't mind the trek through 40 plus hours of gameplay, Fate/Extra, in the end, might just be what you are looking for.